Discussion in 'Non-Vegas Chat' started by Bonzai, Apr 5, 2019. It also said he is a 90% favorite to win again tonight. He was very smart, quick on the buzzer, and wagered well on the daily doubles (for the first one he said "I'm all in" and made a motion like he was pushing chips in the pot). He had a huge lead going in to Final and he did bet pretty small which surprised me. Anyway, I really liked this guy and could see him going on a pretty big winning streak on the show. I did! It was super random that I was watching it. I only saw the first round too. He was crushing it! When he hit that daily double and went from 5k to 10k. Damn. Also, the lady in the middle didn't try to answer a single question on the entire first round lol. That was hilarious. Imagine going on Jeopardy and not knowing ANYTHING. Even I answered a few of them. I record the shows. It only takes me 16 minutes to watch a program. Just finished watching it. Very impressive. His wagering made me think, again, that a lot of times I wonder if the contestants have ever seen the show. I see so many wagering mistakes. One of them is being so conservative on the daily doubles. Not this guy though. The lady in the middle was pretty bad. Sometimes you wonder how some people even make it on the show! I think there is a lot of luck involved on how they do. Sometimes I know every answer, "this is too easy." Sometimes I really struggle. I'm sure it's the same with the contestants. He did good today. Big bet paid off again. maybe they do well when the cameras aren't rolling? anyone remember ralph kramden in the can it core a apple skit? my mother mentioned this to me last night. she knows I read Vegas news daily. she was impressed with him. he is a native of Naperville, IL. 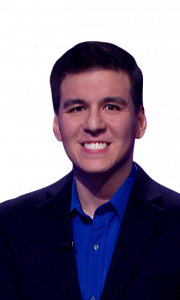 I'm keeping this thread alive, we're discussing Jeopardy every night now lol. That guy, Marshall, on the right was super annoying with how he clicked the button. He was button-mashing like crazy. James is KILLING it with these daily doubles. Went from 12k to 23,914. He bets like a poker player lol. And you gotta love his... "smile" lol. I didn't get to watch this in town, but the local TV ads promoted he was gonna be on last week. I'll need to watch. he is a sharp young man! I like his style. Wow, that's a great win average! I think it often comes down to your speed with the buzzer. Too fast, you get locked out. Too slow, and, well, too slow. But yeah, I'm sure there's a lot of "But I'm the best player on my block..."
His going All In on the Daily Doubles will eventually be his downfall when he gets one wrong. But, it could be quite a while before that happens. He seems to know a wide range of categories and is quick with the buzzer. Yep, there's a light that remains on until the question is finished -- an early attempt locks the buzzer for a half second or so. Or does the light come on when he's done? Don't remember anymore. I'd qualified for the show in the dim past, never got the call to go to California. Hubs just said he read a headline that tonight's episode should be good. It's coming on in 10 minutes for those in the west. I've only watched him twice but he is good! Both in knowledge and buzzer control. I've read stories that Ken Jennings won because he had great timing on the buzzer and he used to bounce around from topic to topic, never staying on the same topic for more than one question. It drove the other players nuts because they were always on edge. Not the most popular guy to the other players but he won the game!